Deep Purple visited the Finnish capital performing together with the Frankfurt Philarmonich Orchestra, a pre-Christmas gift that no real rock fan could miss! 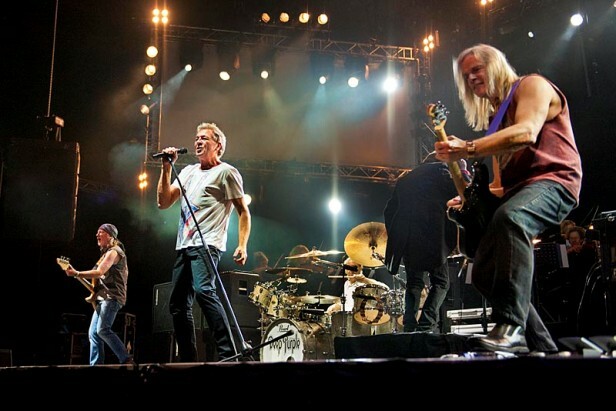 I had seen the band some years ago in Madrid, and one of my first most vivid memories is remembering singer Ian Gillian wearing a horrible hawaian t-shirt… Well, this time Gillian just appeared onstage together with the rest of the members of Deep Purple in a more normal t-shirt, eager to please the Finnish audience. It was the first time in my life that I assited to this kind of combo of rock band playing together with a philarmonich orchestra, and my feelings at the end of the concert were mixed. The name of the current tour is “Songs that Built Rock”, and certainly, when the band starts to play tunes that have forged the history of rock like Highway Star, Woman from Tokyo or Strange Kind of Woman, you fully realize that you are facing a piece of music history live. About the interaction with the philarmonic orchestra, it left some epic moments like when guitarist Steve Morse makes a duel with his guitar against the director of the orchestra holding his violin, or when the string section fully supported the classic Perfect Strangers, the only song that really moved me all over the show, sounding extra powerful. But in some other moments, the show turned to be too slow and lacking rythm. All in all, I have to praise the attitude of the members of the orchestra, that for some moments seemed to be having more fun onstage sharing moments with Deep Purple than the audience of the concert themselves. Of course, another peak of the night is when Steve Morse started to tease the audience playing some famous riffs to finally start the archifamous one for Smoke on the Water, undoubtedly one of the riffs that is forever inserted in rock history.